These historic photos show how good of a hunter Theodore Roosevelt really was. Perhaps no man has ever done more for hunting, fishing and conservation in the United States than the 26th president, Theodore Roosevelt. A hunter and naturalist, Roosevelt established the U.S. Forest Service and designated 18 National Monuments and 150 National Forest areas. He was also one of the founders of Boone & Crockett club, and you can find his countless hunting trophies in natural history museums everywhere. Today, we're celebrating Theodore Roosevelt with some of the best hunting and conservation photos we could find of him in his prime. Roosevelt was born in New York City, but you'd likely never realize it from his larger-than-life persona. As a young man, Teddy posed for this famous photo with a lever-action rifle and deerskin suit that just seems to serve as a prelude to the adventurous life he lived later. While he did plenty of hunting in the American West, his best-known hunting exploits were his big-game African safari trips. This photo was taken during the famous, year-long "Smithsonian-Roosevelt African Expedition" in 1910. His hunting party harvested more than 500 big-game animals during this trip, including this elephant. This is one of the most famous hunting photos we have of Teddy. Another photo from one of his African trips shows Roosevelt with two particularly large leopards. This photo shows Roosevelt with some natives a year after his presidency ended in 1910. This photo's description states they killed the lion with a spear on the Athi Plains of Kenya. 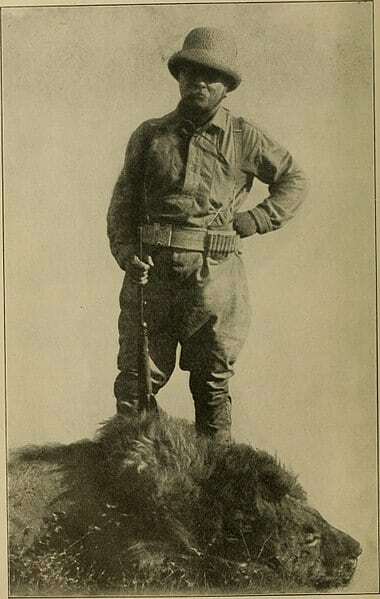 Roosevelt's hunting experiences took him all over the world. Here he's on a trip to the Rockies outside of Glenwood Springs, Colorado, late in his life. Roosevelt always seemed to use the same pose for every photo with a big-game animal. Here he's shown with a hippo on one of his African safaris. In another photo from Roosevelt's huge 1910 hunting expedition, he poses with one of the 17 lions his hunting party harvested. "The bullet went as true as if the place had been plotted with dividers," he later wrote. "The blow brought him up all standing, and he fell forward on his head." The Smithsonian recently restored and displayed the full-body mount of one of his lions. Another photo that likely comes from the 1910 expedition to East Africa. Roosevelt's hunting party sent over 23,000 big- and small-game animals, birds and insects back to the United States on this trip. They sent so much, the Smithsonian ended up sending much of it to other museums! Roosevelt's hunting party harvested six white rhinos on the 1910 expedition. He made no apologies for his actions. "I can be condemned only if the existence of the National Museum, the American Museum of Natural History and all similar zoological institutions are to be condemned," Roosevelt later wrote. Teddy shot this jaguar on his 1913-1914 scientific expedition to the Amazon. He ended up getting very sick on this trip and nearly died. Today you can see the skin rug of this jaguar on display at the Red Rocks State Historic Site in Kansas. You can see both Roosevelt and his son Kermit in this photo from his Brazilian expedition down the Amazon. He later wrote a book about the experience called "Through the Brazilian Wilderness." In one of the most iconic photos ever taken of Roosevelt, he's shown standing side by side with the father of the National Parks, John Muir. Two legends of conservation and nature in an iconic place like Yosemite makes for one truly epic photograph. Without these two, who knows what kind of natural areas would be left for us and future generations to enjoy?